The Donner Party traveled from Bridgers Fort (in what is now southwestern Wyoming) to the salt desert south and west of Salt Lake (near the present Utah-Nevada border). The dated entries below are from the diary of Hiram Miller and James F. Reed. The Diary is controversial to some historians. The existence of the diary was not known until the estate of Martha (Patty) Reed donated it to Sutters Fort Historical Museum in 1945. Apparently neither Virginia nor Patty revealed the diary to McGlashan. Virginia apparently did not use it as a source for her Century Magazine article in 1891. Some of the entries appear to have been written after the events, which led both Stewart and King to question it. King went so far as to suggest that some entries may have been written after Reed arrived in California. The Donners followed the route taken by the Harlan-Young wagons, across the Altamont Divide into the Sulphur Creek drainage (Hilliard Flat), and continued southwesterly over a ridge to the Bear River near Mill Creek. Hastings was ahead scouting, and returned with directions for the Hoppe Party, including the diarist Heinrich Lienhard. Lienhard recorded that, based on Hastings advice, they crossed the ridge west of Sulphur Creek and headed directly to the Bear river. Reeds comment that this turn to the right was said to be a better road suggests that Reed wrote this entry many days later, after he had scouted ahead and caught up to Hastings and the other wagons. Bear River, August 3, 1846 .... I may not have another opportunity of sending you letters till I reach California; .... We take a new route to California, never traveled before this season; consequently our route is over a new an interesting region. We are now in the Bear river valley, in the midst of the Bear River mountains, the summits of which are covered with snow. As I am now writing, we are cheered by a warm summers sun, while but a few miles off, the snow covered mountains are glittering in its beams. I must relate an incident that my father say told happened to him when the party was not far west of Fort Bridger. He says that Patty Reed and he were galloping along on their saddle ponies, when his horse put one or both front feet into a badger or prairie dog burrow and took a hard fall. He was knocked out and when some of the others came to pick him up they found he had a compound break of his left leg between the knee and ankle. Someone was sent back to the Fort for aid in repairing the damage, and after what seemed to him a long time a rough looking man with long whiskers rode up on a mule. He examined the boys leg and proceeded to unroll a small bundle.... Out of this came a short saw and a long bladed knife. The boy of course set up a loud cry when he sensed what was to be done and finally after long discussion convinced his parents that he should keep his leg. The old mountain man was given five dollars and sent back to the Fort muttering to himself for not being given the chance to display his skill as a surgeon. Meanwhile, back at the Fort, the Graves family had arrived, as recounted by William Graves in 1877 in his article in the Russian River Flag : With our three wagons we went on to Fort Bridger; here we heard of The Donner Party, some three or four days ahead of us. This camp was in the upper end of Echo Canyon, the present route of Interstate 80. From Fort Bridger to this point, Hastings Cut-off crosses country that is, to this day, untracked except by the barest of dirt roads. 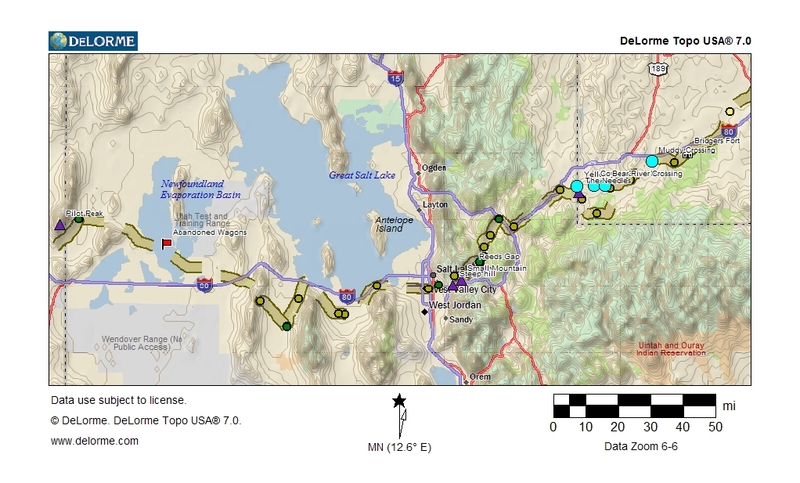 From this point west to the Great Salt Lake the Donners route closely parallels the present Interstate 80 and Utah Highway 65. He says that his misfortunes commenced on leaving Fort Bridger, which place he left on the 31st of August [should be July], 1846, in company with eighty-one others. Nothing of note occurred until the 6th of September [should be August], when they had reached within a few miles of Weaver Canon, where they found a note from a Mr. Hastings, who was twenty miles in advance of them, with sixty wagons, saying that if they would send for him he would put them upon a new route, which would avoid the Canon and lessen the distance to the great Salt Lake several miles. Here the company halted, and appointed three persons, who should overtake Mr. Hastings and engage him to guide them through the new route, which was promptly done. They followed on in the train until they were near the Weber River canon, and within some 4 or 5 days travel of the leading waggons, when they stopped and sent on three men, (Messrs. Reed, Stanton and Pike) to the first company, (with which I was then traveling in company,) to request Mr. Hastings to go back and show them the pack trail from the Red Fork of Weber River to the Lake. Leaving Fort Bridger, we unfortunately took the new route, traveling on without incident of note, until we arrived at the head of Webber canyon. A short distance before reaching this place we found a letter sticking in the top of a sage bush. It was from Hastings. He stated that if we would send a messenger after him he would return and pilot us through a route much shorter and better than the canyon. A meeting of the company was held, when it was resolved to send Messrs. McCutchen, Stanton and myself to Mr. Hastings; also we were at the same time to examine the canon and report at short notice. Stewart accepts Reeds account and names McCutchen as the third member. Mr. Hudspeth and two young men came into camp early this morning, .... They had forced their way though the upper canon, and proceeded six miles further up Weber river, where they met a train of about forty emigrant wagons under the guidance of Mr. Hastings, ... The difficulties to be encountered by these emigrants by the new route will commence at that point; and they will, I fear, be serious. Mr. Hudspeth thinks that the passage through the canon is practicable, by making a road in the bed of the stream at short distances, and cutting the timber and brush in other places. on the 3rd of August as we were making our way down along the river in a northerly direction, and after we had traveled about 5 miles, we encountered Captain Hastings, who had returned to meet us. By his advice we halted here. He was of the opinion that we, like all the companies who had gone in advance of us, were taking the wrong road. He had advised the first companies that on arriving at the Weber River they should turn to the left which would bring them by a shorter route to the Salt Lake; this advice they had not followed, but by good luck they had been able to make their way down the river. It is likely that Hastings was headed back to the canyon entrance to leave the note for the Donner Party warning them against the canyon route. On this day, Reed, Stanton and Pike (or McCutchen) caught up with Hastings at the south end of Salt Lake. Reed wrote in a letter to his brother-in-law James Keyes, paraphrased in the Illinois Journal on December 9, 1846: Mr. Hastings gave them directions concerning this road, and they immediately recommenced their journey. We overtook Mr. Hastings at a place we called Blackrock, south end of Salt Lake, leaving McCutchen and Stanton here, their horses having failed. I obtained a fresh horse from the company Hastings was piloting, and started on my return to our company, with Mr. Hastings. When we arrived at about the place where Salt Lake city is built, Mr. Hastings, finding the distance greater than anticipated by him, stated that he would be compelled to return the next morning to his company. We camped this evening in a canyon. Blackrock is probably the large rock east of Lake Point on the south shore of the lake. The party probably camped in Emigration Canyon. Next morning ascending to the summit of the mountain where we could overlook a portion of the country that lay between us and the head of the cañon, where the Donner party were camped. After he gave me the direction, Mr. Hastings and I separated. He returning to the companies he had left the morning previous, I proceeding on eastward. After descending to what may be called the table land, I took an Indian trail and blazed the route where it was necessary that the road should be made, if the company so directed when they heard the report. When McCutchen, Stanton and myself got through Webber cañon on our way to overtake Mr. Hastings, our conclusions were that many of the wagons would be destroyed in attempting to get through the canon. Mr. Stanton and McCutchen were to return to our company as fast as their horses would stand it, they having nearly given out. I reached the company in the evening and reported to them the conclusions in regard to Weber canon, at the same time stating that the route that I had blazed that day was fair, but would take considerable labor in clearing and digging. They agreed with unanimous voice to take that route if I would direct them in the road making, they working faithfully until it was completed. This is also the account told by Lovina Graves, who was 12 in 1846, to her grandaughter Enda Maybelle Sherwood, who published the story in the San Francisco Chronicle about 1900. As it happens, Lovina was married in 1855 to John Cyrus, who had also emigrated in 1846, but with the Pyle family of the Harlan-Young Party, as mentioned by Lovina. Grandmas people came on toward California and overtook the Donner Party about four days travel with heavy wagons from Fort Bridger. The captain of the Donner Party was then seeking the new road or shortcut to California, when they overtook heavy wagons from his company. It was not exactly a short-cut they were seeking, but an easier and more pleasant road. Their plan was to avoid the steep and disagreeable Weaver canyon. Grandpa Cyrus came to California just a few days ahead of the Donner Party, but through the Weaver canyon. 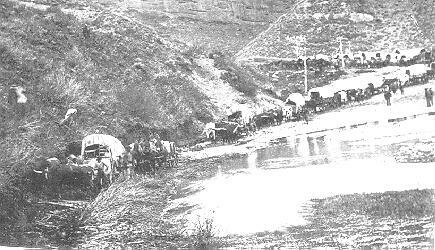 He said that they had to lift their wagons over boulders and even over fallen trees in coming through the canyon, this road was so rough. This camp was in the present Little Emigration Canyon, along Utah Highway 65. Reeds Gap is a low point on the Wasatch crest, south of the present Big Mountain, 8,763. This pass was crossed by the Mormons in 1847 and called Pratts Pass. Only those who have passed through this country on horseback can appreciate the situation. There was absolutely no road, not even a trail. The canon wound around among the hills. Heavy underbrush had to be cut away and used for making a road bed. While cutting our way step by step through the Hastings Cut-off, we were overtaken and joined by the Graves family, consisting of W.F. Graves, his wife and eight children, his son-in-law Jay Fosdick, and a young man by the name of John Snyder. In his article of March 25, 1871, in the Pacific Rural Press , Reed recounts: The afternoon of the second day, we left the creek turning to the right in canyon leading to a divide. Here Mr. Graves and family overtook us. As noted, the Graves family remembers joining the Party just as Reed had returned from his meeting with Hastings. See Entry for August 10. This pass below Big Mountain was improved by the Mormon pioneers the next year, and is still in use today as Utah Highway 65. The camp was in present Little Emigration Canyon. Reed, in his 1871 memoirs, recalled that the first accident that had occurred was caused by the upsetting of one of my wagons, which could be the same accident as this broken axle. Thornton, based on Eddys recollections, wrote that on September 4th, after the Party had reached the Salt Lake, Here Mr. Reed broke an axletree, and they had to go a distance of fifteen miles to obtain timber to repair it. By working all night, Mr. Eddy and Samuel Shoemaker completed the repair for Mr. Reed. Reeds diary makes no mention of this incident, so it is possible Eddy and Thornton were mistaken. Stewart, writing in 1936 before the discovery of the Miller-Reed diary, follows Thornton. 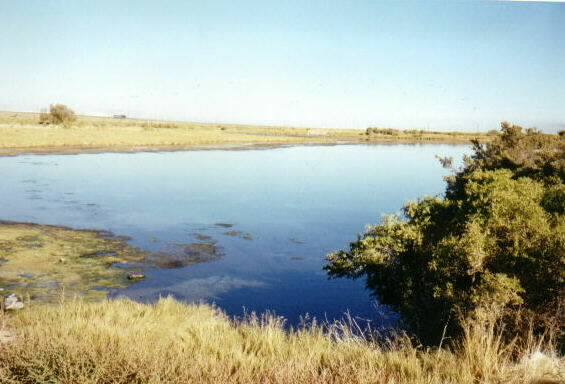 Parleys creek flows straight down to the Salt Lake Valley, and Hastings had ascended it on his way east to meet the emigrants. Pike and Stanton, who had accompanied Reed to overtake Hastings, also followed Parleys creek on their return, and found the Party at Mountain Dell. Messrs. Stanton and Pike, who had been lost from the time Mr. Reed had gone forward with them to explore, were found by the party that had been sent to hunt for them. These men reported the impracticability of passing down the valley in which they then were; and they advised their companions to pass over a low range of hills into a neighboring valley. This they did. 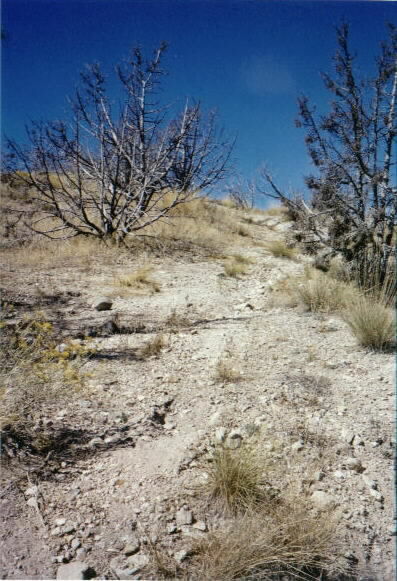 This low range of hills was Little Mountain, to the north of Mountain Dell, and it led into Emigration Canyon. The pack trail down the creek from Mountain Dell was not opened as a wagon road until 1850, by Parley Pratt, and is the present route of Interstate 80 into Salt Lake City. The Donners route down Emigration Canyon is the route of present Emigration Canyon Road, and was the main road to Salt Lake City through the 1860s. During this time the road was cleared for several miles ahead. After leaving this camp the work on the road slackened and the further we advanced the slower the work progressed. I here state that the number of days we were detained in road-making was not the cause by any means, of the company remaining in the mountains during the following winter. Finally we reached the end of the canon where it looked as though our wagons would have to be abandoned. It seemed impossible for the oxen to pull them up the steep hill and the bluffs beyond, but we doubled teams and the work was, at last, accomplished, almost every yoke in the train being required to pull up each wagon. While in this canon Stanton and Pike came into camp; they had suffered greatly on account of the exhaustion of their horses and had come near perishing. Virginias account that Pike and Stanton had not returned until after the Party had already decided to cross to Emigration Canyon contradicts Eddys account (via Thornton) that it was Pike and Stanton who advised the Party to follow that route. As for that final bluff that the Donners surmounted, the Mormon emigrants the next year did not even attempt it. With greater manpower, they cut the road along the canyon bottom. It is a measure of the Donner Partys weariness of the ax and pick that they chose instead to haul their wagons over the bluff, now called Donner Hill. The Donners entered the Valley on the south side of Emigration Canyon. On the north side today is the This is the Place Monument, which commemorates the location that Brigham Young told the pioneers that This is the place. In fact, the Mormon road also was on the south side of the canyon. 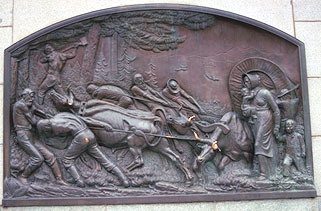 The monument contains a plaque honoring the Donner Partys work in opening the route. In his1871 article in the Pacific Rural Press , Reed wrote: We progressed our way and crossed the outlet of the Utah, now called the Jordon, a little below the location of Salt Lake City. 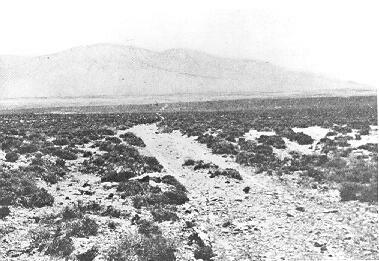 This crossing was near present South Salt Lake, approximately 2700 South Street, about 4 miles south of the Temple Street ford used by some of the Harlan-Young party. The diary entry about taking 18 days to travel 30 miles was Reeds later-added margin comment. 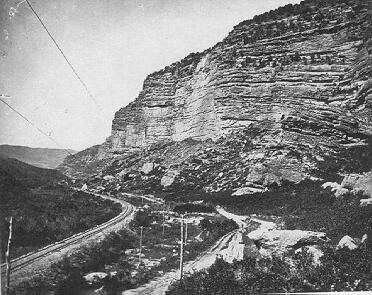 Reed thus accounts for 18 days spent making the road across the Wasatch to avoid the Weber Canyon descent taken by Hudspeth and the Harlan-Young wagons. Reed under-estimated the mileage, as his own diary entry mileage adds to 39. He repeated his estimate of the time to George McKinstry, who reported in a letter dated February 13, 1847 to the California Star : and Mr. Reed and others who left the company, and came in for assistance, informed me that they were sixteen days making the road, as the men would not work one quarter of their time. Reed also reported this estimate in his report paraphrased in the Illinois Journal of December 9, 1847: After traveling eighteen days they accomplished the distance of thirty miles, with great labor and exertion, being obliged to cut the whole road through a forest of pine and aspen. James Mathers, who left his original party at Bridgers Fort, caught up to the Harlan wagons at the Bear River, and reached the entrance of the Weber River canyon on July 29, 1846. He reached the Utah outlet on August 7th, for a total of ten days. Like the Donners, the Harlan Party spent some time in camp while members explored alternate routes. Taking Reeds account as accurate, the detour over the Wasatch delayed the Donner Party by eight days. Other accounts ascribe more time lost to the crossing of Big Mountain. Thorntons account, based on Eddys recollections, describes the crossing of the Wasatch and concludes They were thus occupied thirty days in traveling forty miles. Thorntons estimate of mileage is closer to the actual distance of 35 miles from Henefer to Salt Lake, measured by the Mormon Roadometer of 1847. More important than the lost time was the physical and psychological cost of cutting the road and enduring the mutual resentment between those who chose the route and those who had to cut it out of the woods. Tues 25 left Camp early this morning intending if possibl to make the Lower wells being fair water 20 which we made and in the evening a Gentleman by the name of Luke Halloran, died of Consumption having been brough from Bridgers Fort by George Donner a distance 151 Miles we made him a Coffin and Burried him at the upper wells at the forks of the road in a beautiful place fair water"
The Trail followed the general course of present Utah Highway 138 to near Grantsville, Utah. 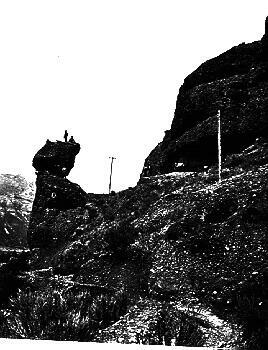 They passed Adobe Rock in Tooele Valley, described by Bryant as several remarkable rocks rising in tower-like shapes from the plain, to the height of sixty or eighty feet. 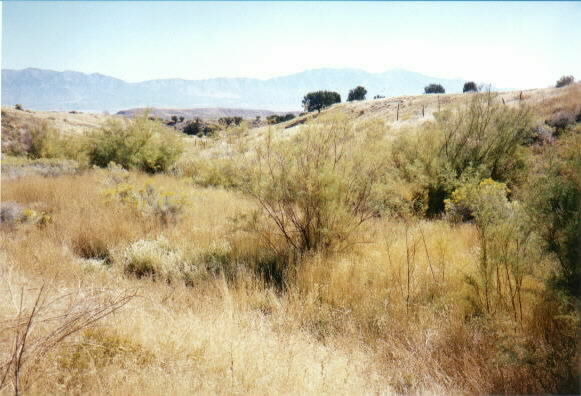 The upper wells were south of the Lake, at present Grantsville, Utah. Grantsville is the home of the Donner-Reed Museum, which contains artifacts recovered from the Salt Desert. Hallorans body was buried in a bed of almot pure salt, beside the grave of one who had perished in the preceding train. It was said at the time that bodies thus deposited would not decompose, on account of the preservative properties of the salt. Soon after his burial, his trunk was opened, and Masonic papers and regalia bore witness to the fact that Mr. Halloran was a member of the Masonic Order. James F. Reed, Milton Elliott, and perhaps one or two others in the train, also belonged to the mystic tie. The day ... was spent, with the exception of a change of camp, in committing the body of their friend to the dust. They buried him at the side of an emigrant who had died in the advance company. The deceased gave his property, some $1500, to Mr. George Donner. The amount was verified by a note found in the Miller-Reed Diary when it was donated to Sutters Fort in 1945. The note lists A Statement of Breen & Halloran/Stock of Merch, etc., taken June 25th - 1845 and lists Hallorans stock as $1,435. It is not known who took this stock, and it is likely that the name Breen refers to a different Breen than Patrick Breen. Luke Halloran thus became the first casualty of the Donner Party. The other emigrant who was buried at the fork of the road was John Hargrave who had died on August 11, as recorded in Heinrich Lienhards diary. We were now encamped in a valley called Twenty Wells. The water in these wells was pure and cold, welcome enough after the alkaline pools from which we had been forced to drink. they resumed their journey, and after dark encamped at a place to which they gave the name of the Twenty Wells. The name was suggested by the circumstances of there being at this place that number of natural wells, filled to the very surface of the earth with the purest cold water. They sounded some of them with lines of more than seventy feet, without finding bottom. They varied from six inches to nine feet in diameter. None of them was overflowed; and, what is most extraordinary, the ground was dry and hard near the very edge of the water, and upon taking water out, the wells would instantly fill again. Reeds diary and these other accounts appear to confuse two different wells. According to Morgan and Stewart, Twenty Wells is the site of present Grantsville on the east side of the Stansbury Mountains. These wells are shown on T.H. Jeffersons map as Hastings Wells. Reed called these the Upper Wells, and says that only one was fresh water, the rest brackish. By contrast, Reed describes the wells at the beginning of the dry drive as all fresh. These are shown on Jeffersons map as Hope Wells in Skull Valley on the west side of the Stansbury Mountains. Thornton describes a days march beyond Twenty Wells to another set of similar wells in a large and beautiful meadow. ... Here they found a letter from Lansford W. Hastings, informing them that it would occupy two days and nights of hard driving to reach the next water and grass. Close by the largest well stood a rueful spectacle,-- a bewildering guide board, flecked with bits of white paper, showing that the notice or message which had recently been pasted and tacked thereon had since been stripped off in irregular bits. 2 days -- 2 nights -- hard drving -- cross -- desert -- reach water. As Eliza was only four in 1846, she may have relied on Thornton and family legends when writing the story sixty years after the event. Thornton and Houghton may have been confused about the letter from Hastings. This letter is not mentioned by James Reed in any of his accounts, nor by Virginia Reed. James Reed had caught up to Hastings on August 9 near the point of the lake. Hastings probably told Reed directly about the dry drive then. Hastings and the Harlan-Young Party made the dry drive from August 17-22. Certainly Hastings had not re-crossed the dry drive to provide new information in a letter. Perhaps Thornton and Houghton confused the story of Hastings earlier letter at the Weber River canyon. Reeds entry about water Brackish appears to be a reference to the springs at the next enacampment, as this contradicts the previous days entry that the camp of the 28th and 29th contained a No of delightful fresh water wells. This is more evidence that Reed updated his diary entries a day or more after the events. Son 30 Made this day 12 to a Silphur Spring in the Mountain which ought to be avoided water not good for Cattle, emigrants should keep on the edge of the lake and avoid the Mountain entirely here commenced the long drive through the Salt desert. The Trail crossed Skull Valley from the springs along the western base of the Stansbury Mountains, to Redlum Spring in the Cedar Mountains. The Trail can be seen just north of Henry Spring Road. 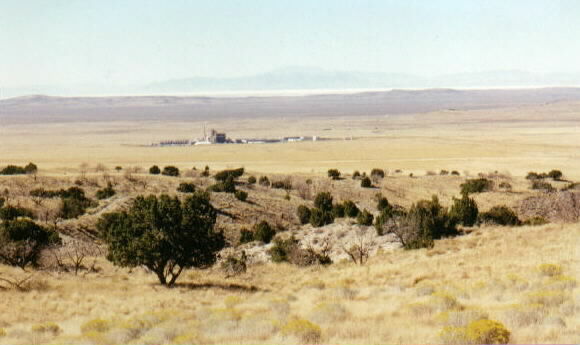 The dry drive across the Salt Desert began on the east side of the Cedar Mountains after leaving Redlum Spring, and crossed the difficult Hastings Pass to the west side of the Cedar Mountains. As the emigrants headed down the Pass, they got their first view of Pilot Peak and a glimpse of the salt covered mud flats. Reed suggested not crossing the Cedar Mountains via Hastings Pass, but instead skirting the base of the mountains towards a lower pass to the north. This is the pass where present Interstate 80 crosses the Cedar Mountains west of Rowley Junction. Reed may have been motivated by the difficulty of crossing Hastings Pass, as indicated by T.H. Jefferson on his map: East to west side Scorpion Mt., 9 miles. Road, steep hills, some sideling, rather bad. The Trail headed northwest from Hastings Pass, crossing present Interstate 80 near the Aragonite exit, and then crossed the Gray Back Hills just north of present Interstate 80.